My favorite comfort meal has always been meatloaf and mashed potatoes. 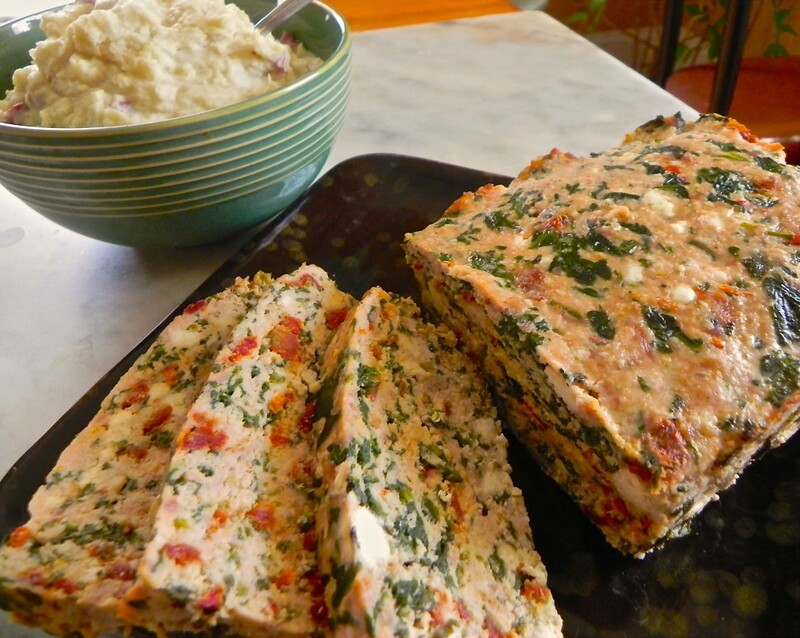 And my favorite meatloaf is made with ground turkey ( nice and creamy), sundried tomato, spinach and feta cheese. This colorful variation of the American classic makes frequent appearances on my personal chef menus for The Good Eats Company. Just for today we will call this a winter entree, but I enjoy it all year long, making it for myself when I start to miss its distinctive aroma. This entry was posted in gluten free, main courses, winter and tagged feta cheese, gluten free, ground turkey, meatloaf, spinach, sundried tomato on January 25, 2013 by Michele Humlan. There is nothing more satisfying than eating a meal that sticks with you for hours and makes you feel just right : invigorated and not drowsy, satiated and not bloated, comforted, yet knowing you have eaten your carbs virtuously. Today’s vegan meal is brain food. High protein black lentils and red quinoa, paired with the antioxidant power of cashews and dried cranberries, plus the beta-carotene of kabocha squash, et voila! Food for the brain, and the hungry belly. Sure, it all sounds healthy, but what you really want to know is…does it taste good? The answer is a resounding yes. Chewed thoughtfully (this meal cannot be fully appreciated on the run, as both lentils and quinoa require some jaw power) with a wispy side salad and your favorite beverage, this dish satisfies and uplifts the spirit. I call this dinner, but you may offer it up as a filling side dish; it would be welcome at any dinner or brunch buffet, enjoyed by diners of any persuasion. This entry was posted in gluten free, main courses, side dishes, vegan, vegetarian, winter and tagged black lentils, cashews, dried cranberries, kabocha squash, red quinoa, winter squash on January 18, 2013 by Michele Humlan. Folks are deeply into New Year’s resolution mode : salad green mixes are flying off the shelves and merchants cannot keep up with the demand. So. You have resolved to eat more salads and fewer French fries. And what are you putting on your colorful, crunchy salads? How about propylene glycol alginate, high fructose corn syrup, sodium benzoate and potassium sorbate? Not quite what you had in mind when you signed up for better health in 2013, huh? I thought so. These keep your commercial salad dressings shelf-worthy, but who knows what they do to our bodies, our temples. I would love to convince you that making your own salad dressing is easy, cost effective and a healthier choice overall. This entry was posted in condiments, gluten free, salads, vegan, vegetarian, winter and tagged citrus recipes, salad dressings, vinaigrettes on January 11, 2013 by Michele Humlan. When winter’s chill is in the air, your fireside alcoholic beverage of choice may be hot cocoa with a splash of Kahlua, mulled wine or hot spiced apple cider with a splash of rum. I love to warm up with a hot drink but a chilled, tart and not-too-sweet cocktail hits the spot and whets my appetite for the piping hot dinner feast to come. My favorite beverages live among the innovative cocktail offerings of Acacia Mid-town here in Richmond, Virginia. Alas, evenings out on the town are limited, so if I have a hankering for a cocktail the mixologist must be me, or perhaps my neighbor Janie, who makes fabulous themed cocktails for dinner gatherings with friends. For this autumn’s outdoor viewing of the film noir classic Gun Crazy, Janie prepared sidecars, the vintage mixed drink, authentic and refreshing, with her usual verve and enthusiasm. This entry was posted in appetizers, beverages, cocktails, gluten free, vegan, vegetarian, winter and tagged cocktails, limoncello, pomegranate, rum, tangerine, tangerine rosemary simple syrup, vodka on January 4, 2013 by Michele Humlan.